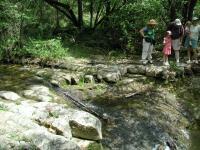 Hiking at Bright Leaf Preserve is by guided hike only. Check out the Friends of Bright Leaf web page for scheduling. To all of you AustinExplorers wondering how to get access to this hike: they only allow you to hike the trails on guided hikes. 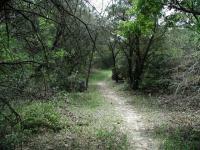 The land was left to the Austin Community Foundation by Georgia Lucas, and she stipulated in her will that all hikes must be guided. Now, onto our hike: Including the two of us, there were seven hikers that showed up this Saturday. Nancy (from ACF) and Nancy (from Friends of Bright Leaf) were our guides. We hiked the major loop clockwise up to the top of Mt. Lucas (which is supposedly 39' higher than Mt. Bonnell). At the top, we got to see Georgia's "out of town" house, which has a stunning view of the lake and surrounding area. Although we gained (and later lost) quite a bit of elevation, the trail was never very steep. This combined with the moderate pace of the group accounts for the lower difficulty rating. After the hike, neither of us were tired at all - just felt warmed up to do another, "real" hike. :-) However, we very much enjoyed this hike, the sights, and the knowledge shared by the Nancy's. We will definitely return. Nice park, but when will it open for public use? I hiked this park several years ago during Earth Day or something similar. The terrain is similar to Wild Basin or other parks in the area, and it is a relatively dry area, without a lot of water. For various reasons, this park was donated to the state rather than the city, and the state has not opened it to the public for use. You have to go with a group. 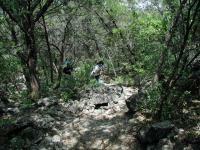 I took a guided hike as part of Austin Nature Day. The tour was a shortened 1 mile loop, but it looks like on a regular day one could get up to 4 or 5 miles. There was lots of shade and some fun, rocky trails. Great hike for location. Hills & Views. 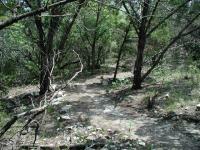 Check the Friends of Bright Leaf Yahoo Group Site for Guided Nature Hikes of this area. 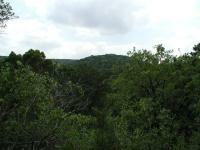 http://groups.yahoo.com/group/fobl/ Meet at 8:30 a.m. on August 3, 2002 for a 2 hour guided nature hike.